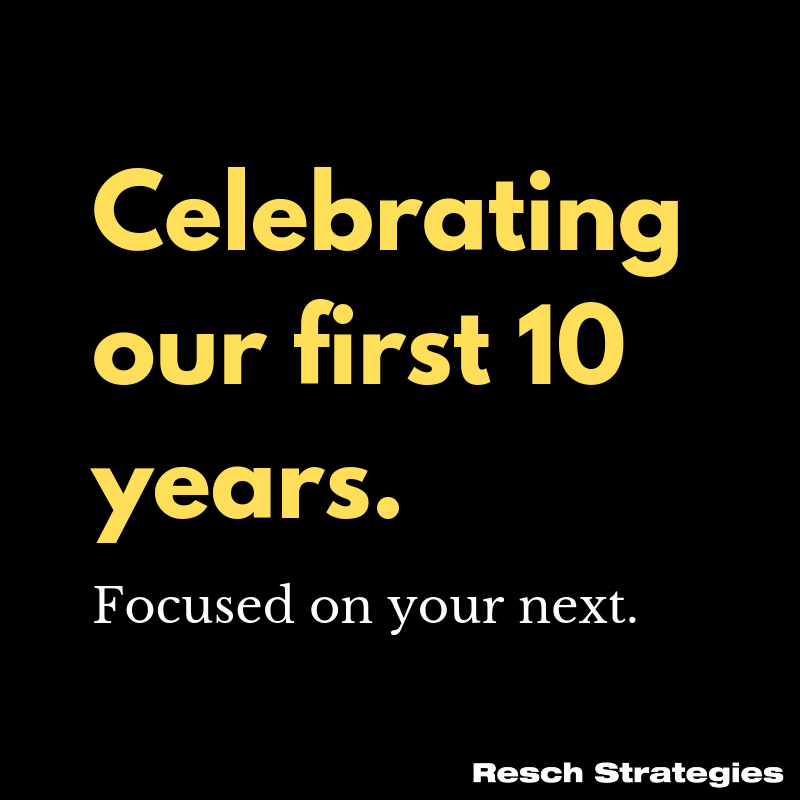 Ten years ago, Resch Strategies was launched. A number of months of thought, planning, counsel from close friends, stress, and anticipation came to life in an announcement email leading with a quote from Kramer… from Seinfeld. Ten years later, the “I” is now a “we,” and we are still very much out there and loving every minute of it. Our list of “Thank Yous” is long. My family -- Brenda, most specifically (Those who follow me on Facebook know that my boys bring a lot to the table. Support for my work and our collective livelihood are not high on that list.). It would be impossible to launch and grow an effort like this without loving support at home, and Brenda has offered that unconditionally. It was never a goal of mine to own a business. It always seemed like a hassle, a lot of stress, and dealing with things I was happy to let others handle. And those things most certainly come with the job. But those things are also entirely manageable when tackled by a talented and hard working group of colleagues… and friends. Resch Strategies has steadily and purposefully grown over the last decade, and one of my favorite questions to answer is “How many people do you have on your team now?” Each and every person who is or has been part of the Resch Strategies team has contributed in reaching this milestone. Nick, Stephanie, Joe, Nikki, Laura, Sarah, Gina, and Cirsten, whether over nine years or a few-months internship, your personalities and work have shaped what this has become. I am grateful to all of you, and am excited for what’s next. Our clients and project partners, who, over the last decade, have trusted us, hired us, referred us, and worked alongside us. You are why we do the work and strive for our best. You challenge us and provide us the opportunity to learn and grow in your service. Today, we are celebrating our first 10 years. We are focused on your next. Happiest of Holidays from all of us at Resch Strategies!